Click Here for a full game preview with analysis and expert betting picks . Right now the line sits with New England favored by 4.5, and there is a decent chance that it will fall down to four if there is no further big news developments - like, for example, if Rob Gronkowski were not cleared out of the concussion protocol in time for kickoff. My first gut instinct is that the line is tough - tougher than last year, when the Patriots were only giving up a field goal to the Falcons. I've gone back and forth because I respect the Eagles, and I have some concerns about this New England team. In the end, though, I only see one option to take on this line - the Patriots. There are many reasons for that, but ultimately it comes down to four. First, Tom Brady is better than Nick Foles. I like and respect Foles more than many, but this is still a mismatch of historical proportions. In a league as driven by quarterbacks as this one is right now, and in a game as pressure packed as this one is, I just can't justify taking anything other than the best guy at a reasonable price - and these odds are fairly reasonable and moving in the right direction. Second, experience. This game is unlike any other. When you hear any guy who has played in the game talk about it they talk about how overwhelming it is, how they felt coming out of the tunnel, and how unlike any other game it is. Everything takes longer, emotions run hotter, and everything feels more serious. Even the most stable veteran can be shaken by it, and it can have a big impact on their play - both early on and down the stretch. For the Patriots, though, nothing about this is unique. They make a habit of playing in this game, so they have both recent and long-term experience with knowing what works and what they need to do. I'd rather be with that experience heading into this giant circus than against it. Third, both Matt Patricia and Josh McDaniels are in their last games with a team that they have been with for a long time, had tremendous success with, and owe a lot to. They are both very driven and have been mentored by the most robotic coach there is. They are going to want to come out and end their time in style - making a statement on their way out. They are both creative and determined, and they both have a history of keeping opponents off guard with new twists and mid-game adjustments. Again, I'd rather be with them than against them. 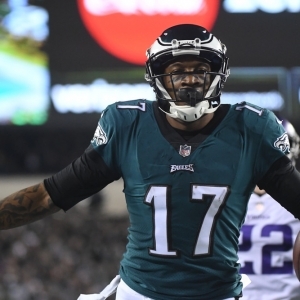 Fourth, the public is quite significantly on the Eagles - about 55 percent of bets so far have been on them in the first 10 days of betting action. I don't have a lot of respect for the betting public in general, and especially in this game, so if they think one way I am happy to think the other. Longest reception by Rob Gronkowski ("over/under" 25.5 yards): I'm assuming, of course, that Gronk will be playing, and I wouldn't place the bet until that is confirmed. If he is, though, then the over is a comfortable play here. He has played in 15 games this year, including the playoffs. In none of those games his longest pass was longer than 25.5 yards. That's a good ratio. There is no player on the field aside from Brady who the Eagles will fear more. McDaniels will know that, and he will look to take advantage of it. Philly will try to contain Gronk, so I expect the Patriots to go to him early to get inside the heads of their opponents. I like the over a lot. Leslie Odom Jr. wears a tie to sing 'America the Beautiful'? : This is a bit random, but there is solid value here. The "yes" is at +135, and that is a grand price. If you aren't up to date on your knowledge of musical theater, Odom played Aaron Burr when the megahit musical Hamilton debuted on Broadway. Lin-Manuel Miranda, who wrote the play and played Hamilton, was the biggest name, but Odom got credit from most as the best performer. Outside of his Broadway career he's also a singer, which is why he is singing here. He's also a very stylish guy. All you have to do is do a Google search to see that he always cares about how he looks, and he often wears a tie - as often as not a bow tie. Singing this song is a solemn honor. If a guy likes to look sharp regularly, then it only seems reasonable that he will be dressed sharply for this incredibly bright spotlight. I'm no fashion maven, but I have a strong feeling about this one.